Yard Art is a distributor specializing in innovative modern outdoor site furnishings. There are cataloged designs and sizes, and most items can be built to specification. Our product portfolio includes custom fabricated metal planters, modern fountains, outdoor fire pits, cast stone fountains, and other site furnishings made in the USA. Contact us today, and tell us about your project. Planters allow you to have flexibility in the design and creativity of your home and garden. You can transform any ordinary space into an attractive arena using planters. They can be custom sized so the only limitation is your imagination. 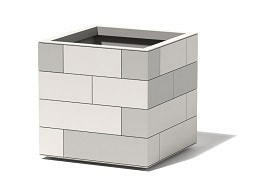 Made of 14-gauge mild steel, corten steel, or powder coated marine grade aluminum, these modern metal planters are designed for use indoor or outdoors, and deliver a strong sculptural statement that has an architectural yet organic feel. Design and fabrication of our metal planters is done in the USA using recyclable materials and sustainable methods. Our more traditional garden planters are available in a wide variety of finishes and textures to better customize your outdoor space. Made from glass fiber reinforced concrete, (GFRC), to outlast traditional cast stone at a substantial weight savings, making these planters the perfect choice for use indoors or outdoors. Fountains have been used for thousands of years to add dramatic touches to public and private gardens. Our selection of fountains reflect the ancient architectural design of the past with a modern flair. Yard Art is proud to offer you a wide selection of unique garden fountains available in brass or concrete. Fountains command attention in a space, so don't hide your fountain. Use your fountain to create a point of interest outside your home, or make the fountain a destination for a garden path. The colors of your yard or garden are of your own choosing. Your fountain selection is not limited to design only. You pick the color. The color palette for our concrete garden fountains allows you to select a color to complement your fountains' surroundings. Our collection of brass fountains create elegance in all indoor and outdoor settings. The incredible detail inherent in our sculptures is created as each piece is cast in brass by the "Lost Wax" method, one at a time, ensuring exceptionally fine detail and lasting beauty. You can find and purchase all of our garden planters and water fountains by browsing our store. If you prefer to order by phone, please call us at (925) 234-3153. We look forward to helping you find the perfect water fountain or unique planters for your indoor or outdoor space. Thank you for shopping at Yard Art.